USASBE 2019 – See You in Florida! 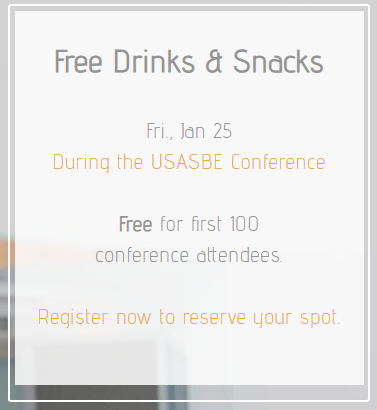 Are you going to the USASBE conference in St. Pete Beach, FL in January? You should – we got so much value from last year’s conference. This conference is an incredible few days of entrepreneurship educators and folks planning entrepreneurship programs sharing their work and ideas. If you’re going, we’ll see you there! Let’s get the important stuff out of the way first. We’re hoping to host our second-annual happy hour party Friday night after the conference activities. We’ve got room for 100 USASBE Conference attendees to join us, so register here if you’d like to attend. Mechanical Pencil Challenge: Defining “Early Adopters” And Where To Find Them (Fri. @9:30 am in the Banyan room & again Sun. @9:30 am in Blue Heron). This exercise uses mechanical pencils, and a 10-minute competition between attendees, to introduce Early Adopters. 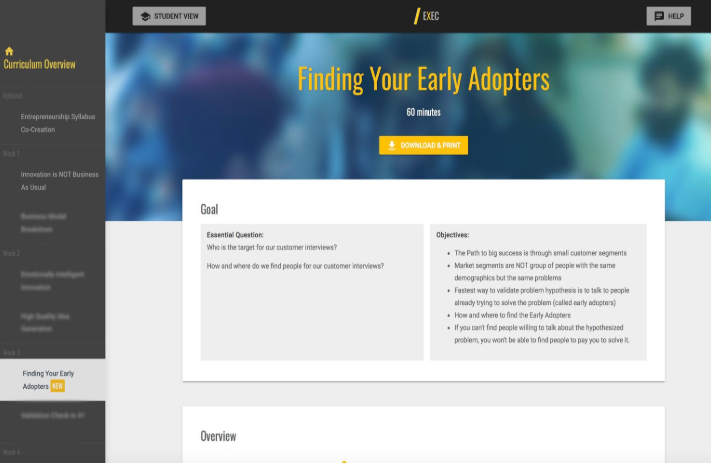 We contrast them with Early Majority and Late Majority customers, and demonstrate where and how to find a business model’s Early Adopters. A Better Toothbrush: Testing Assumptions Via Customer Observations (Fri. @9:30 am in the Banyan room & again Sun. @ 9:30 am in Blue Heron). This fun and high energy exercise utilizes children’s toothbrushes to help attendees see how easily they can make hidden assumptions that hinder the success of a project. We introduce attendees to customer observations, a tool to mitigate the consequences of hidden assumptions. Overall, this is an engaging Design Thinking exercise that encourages attendees to assume less, and observe more. Rigorously Assessing Experiential Courses: Transparent Grading Using Check-Ins, Mini-Cases, And Reflections (Sat. @ 9:30 am in Snowy Egret). During this session, attendees feel how frustrating it is to be evaluated by vague/subjective criteria. Attendees learn five tools for transparently evaluating experiential courses and then brainstorm ways they can incorporate these techniques in their course. Attendees leave with session with a set of detailed sample rubrics that will enable them to both teach more experientially and assess more objectively. 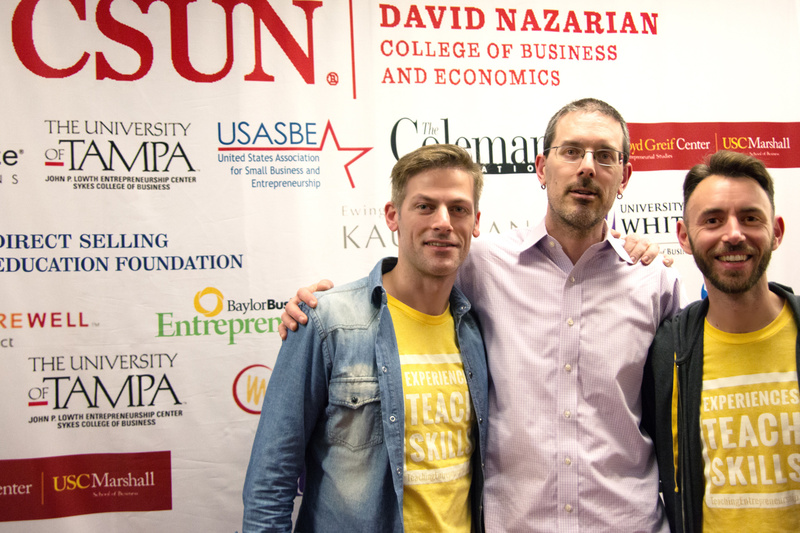 …are finalists for the 3E Experiential Entrepreneurial Exercises Competition! Come cheer us on at 9:30am on Friday in Banyan! 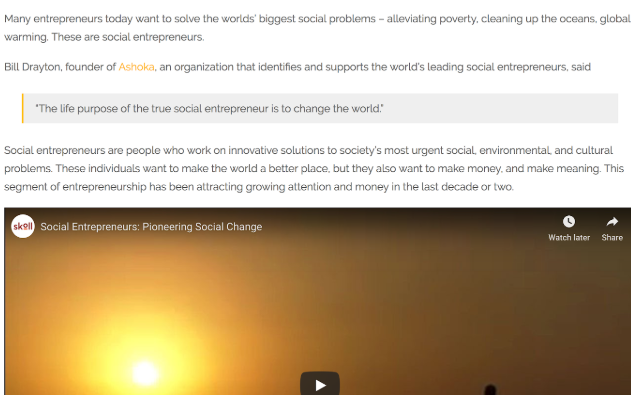 We’re building the entrepreneurship curriculum you dream of teaching. At least that’s what we’re trying to do. The feedback from our pilot professors tells us we are doing pretty well. There have been hiccups, and learning moments, but our agile team and processes have allowed us to respond promptly and create an engaging user experience for both professors and students. At this point last year, our the Experiential Entrepreneurship Curriculum (ExEC) was in roughly 20 schools. Strong demand for a structured, experiential, 15-week entrepreneurship curriculum has doubled the number of universities we’re in. We interview professors multiple times during the semester. Our team invites students to talk with us so we can learn more about how they feel living the curriculum, what we are missing, and what we are doing well. We work tremendously hard to gather, analyze, and constantly make updates for next semester, not “next revisions” like traditional textbooks. The ExEC you see today is a result of our vision and assumptions, continuously tested with students and professors around the world. After practicing what we preach and talking extensively with our professors, it was clear we needed to make some changes to our Professor Portal. We practice what we preach in building our product. It worked as an MVP and allowed us to test a variety of our assumptions, but ultimately our professors told us Google Docs was too cumbersome to use, and to print from. 1. The Goals and objectives of that lesson. We frame each lesson in practical terms for our professors so they quickly understand why the lesson is important, and what their students will learn. 2. An overview showing where that lesson fits into the scheme and flow of the overall curriculum. We understand it is useful to always understand the big picture – where we’ve been, where we are, and where we are going. 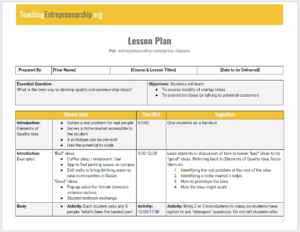 We also map our entrepreneurship curriculum flow onto the Business Model Canvas to highlight what lessons are applicable for particular boxes on the Canvas. 3. An overview video explaining the lesson, and Google Slides for classroom use. Our goal is for our professors to succeed, and that means providing information and tools. Some use slides and some do not, but we offer them just in case. We know some prefer videos to long text, so we offer both, just in case. 4. Instructions for how to prepare before class, including all the necessary resources. Experiential education is really difficult to execute. We provide our professors with a ton of direction to prepare for each lesson. We want them to succeed, and we want their students to remember each and every learning experience throughout the entrepreneurship curriculum. 5. A minute-by-minute exhaustive outline for delivering the lesson during class. What can we say, we are a but obsessive at times. But we figured more detail was better than less detail. 6. Instructions for what students could and should be doing after class. Let’s be honest – what happens after the class is just as important to a student’s learning experience as what happens within the confines of the particular class period. 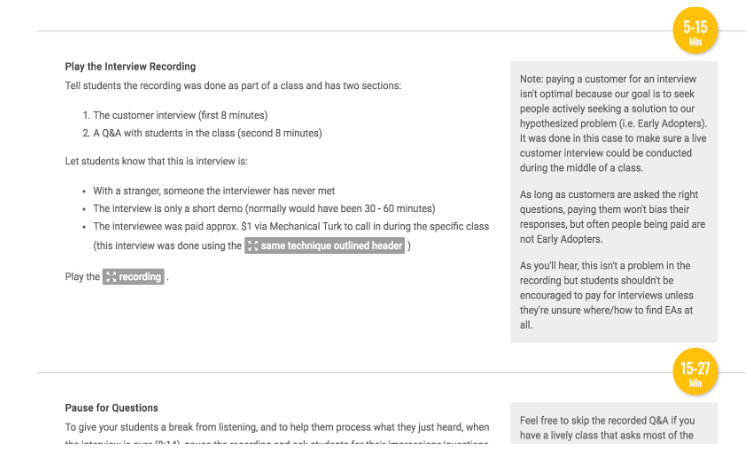 While testing our first version, one need we heard consistently from professors was guidance on how to assess their students. They loved the experiential nature of the exercises, but they were not always clear on how they could help students understand their progression through the understanding and application of that content. 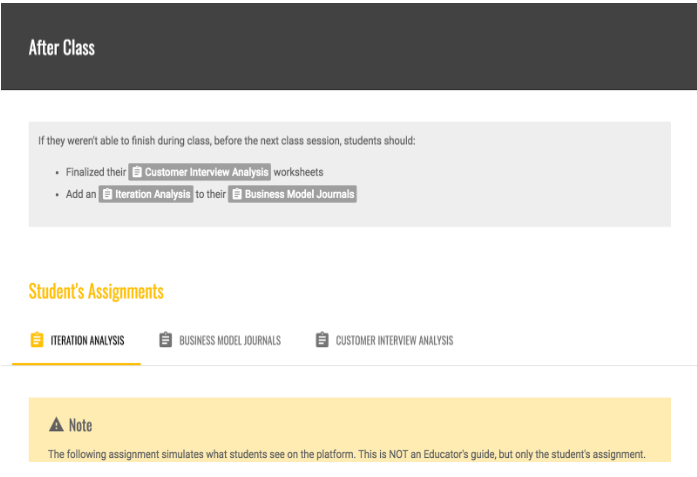 So we built an Assessment Guide into our updated entrepreneurship curriculum to help our professors provide quality feedback to students throughout the process. 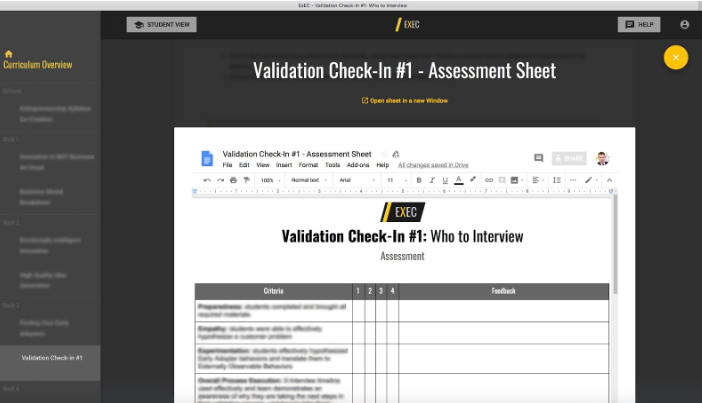 During the semester, students progress through 5 Validation Check-Ins. 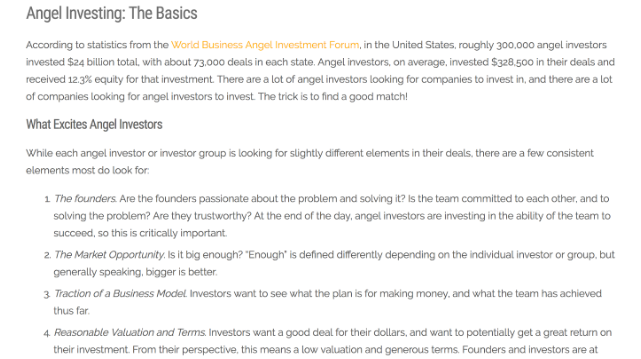 These are basically progressive pitches that act as the main opportunity for assessment. We give our professors rubrics and detailed guidance on how to assess the students’ documents and pitches. Our goal with assessment is not just to help professors provide a grade, but to help professors provide meaningful and timely feedback to students. For more on our approach to assessment, read our post 4 Steps to Assessing an Experiential Class. One of the other pieces of feedback we got early on was that professors wanted to use us as the sole resource for their class. To do that though, we needed to add some breadth, in addition to our depth. We feel confident we cover idea generation, customer interviewing, business modeling, and prototyping comprehensively, but what about finance, legal issues, branding, etc.? 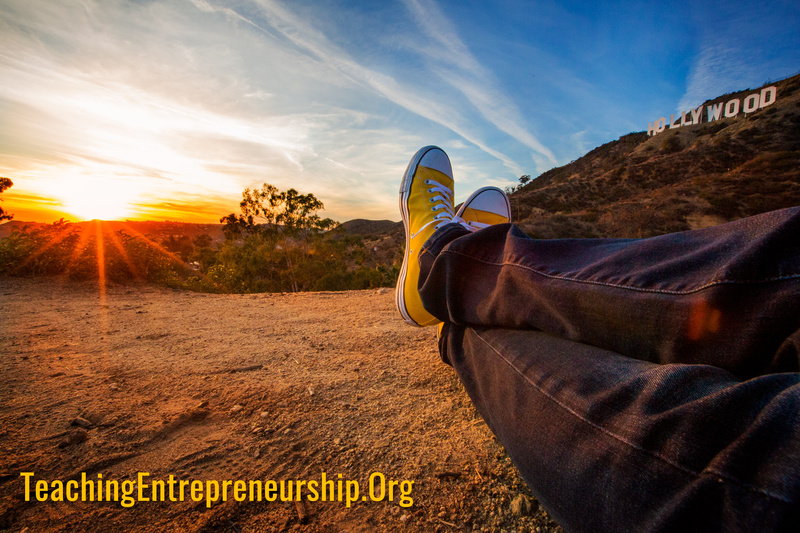 So we conducted an extensive analysis of entrepreneurship curriculum, textbooks and syllabi, and interviewed dozens of the most respected entrepreneurship professors and entrepreneurs. Our goal was to understand what information would be most useful for students beyond our core offering. From that research, we developed an extensive Resource Guide that currently includes 17 modules. These modules are by no means an complete exploration of the particular topic. Instead we offer an overview of the topic, a deep dive into some of the basics and the critical components of the topic, and then recommend an extensive list of curated resources and readings of that particular topic. 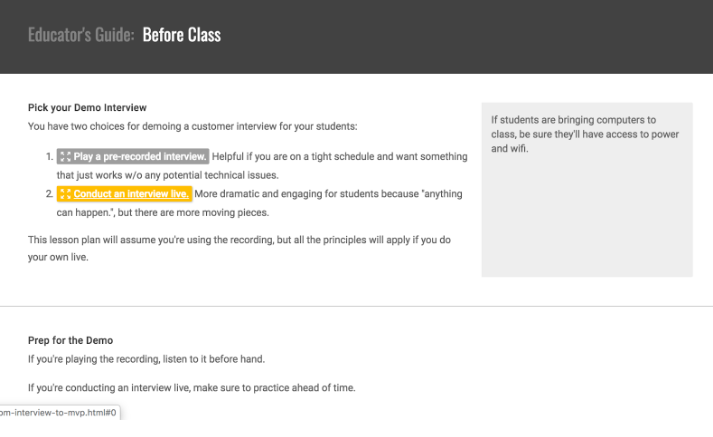 We want our professors to feel comfortable knowing if they recommend their students go through one of our Resource Guides, they will emerge with a solid understanding of the topic and how to apply that content to their context. We are not the experts all of these topics, but have done considerable research to better inform our professors around these topics of interest. 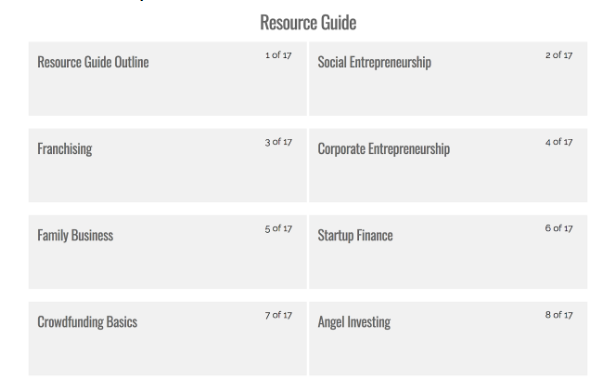 What we offer within each resource guide is an evolving list of additional resources (articles, books, videos, etc.) for students to continue their learning of a particular topic, or for professors to use as additional resources. This Resource Guide is an evolving offering. 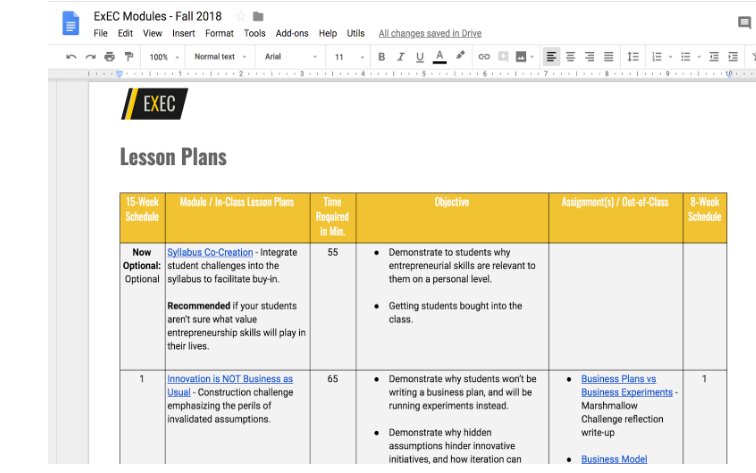 As we hear from professors using our ExEC curriculum, or the community of 3,200+ professors reading our blog, that a certain topic is critical in entrepreneurship education, we will build a Resource Guide ourselves, or invite subject-matter experts to help us build one. 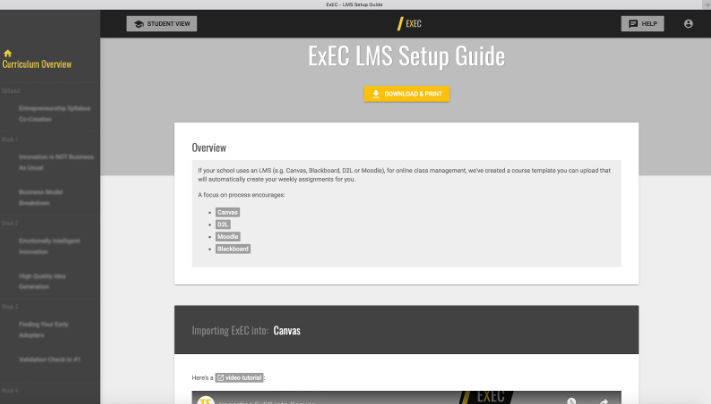 Our last major update is integrating with Canvas, D2L, Moodle and Blackboard. In our first version, students and professors had to download and upload documents, assignments, slides, and other materials. We heard loud and clear that this was not a great user experience. We now offer the capability of uploading all our content neatly into the four learning management systems mentioned above. This will greatly reduce the setup time for our professors, and will provide a more comfortable learning process for the students. As you can see, we have been hard at work learning what works and what doesn’t with ExEC. We constantly gather feedback from students and from professors. With this feedback, we strive to provide the ultimate experiential learning opportunity to entrepreneurship educators. 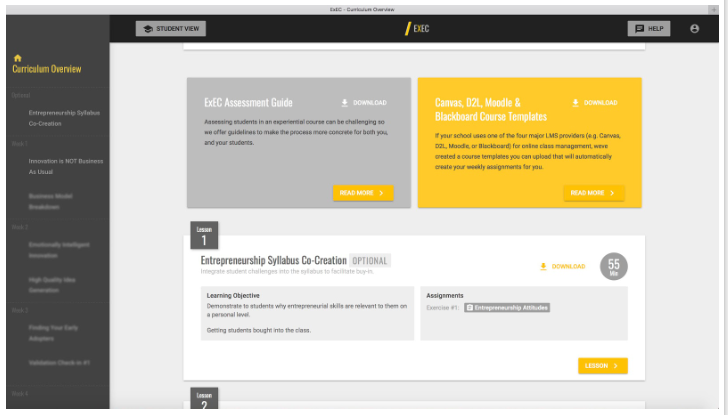 We’ve been updating our curriculum and platform based on feedback from hundreds of professors and thousands of students. 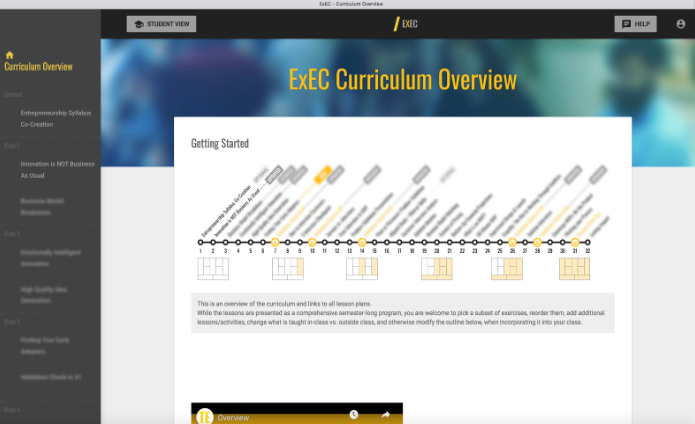 If you are looking for a fully structured, experiential entrepreneurship curriculum, with 15 weeks of lesson plans that students love, an in-depth complementary Resource Guide, and a comprehensive Assessment Guide, you should check out ExEC.